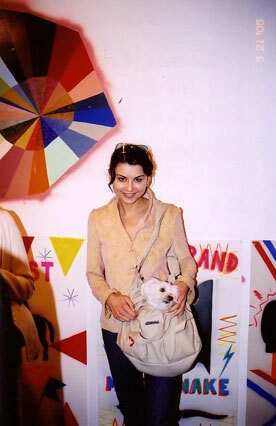 OKSANA LADA, the actress who plays TONY SOPRANO’S Russian mistress, Irina, on HBO’S ‘THE SOPRANOS’ at the S*F*D* ‘FIX BOX’ opening , with her little dog, Kasha, RARE Gallery, NYC, May 21, 2005. S*F*D* FIX BOX was one of the best & edgiest shows of all 2005. The show opened on May 21, 2005 & ran until June 18, 2005. S*F*D*’s hi energy apparently exploded beyond the gallery walls. To the delight of many Chelsea regulars, a PATRICK MIMRAN BILLBOARD was graffiti attacked in recent days & his message was subverted to read – “IGNORE IT IF YOU CAN – THE WAR IS ALL AROUND YOU”. Apparently always ready to rumble for a good cause, S*F*D* lived up to their name, at the show’s afterparty. 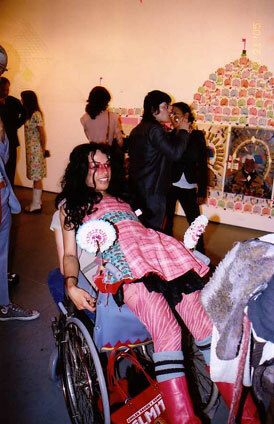 When the RARE people refused to foot the bill for the artists’ dinner, S*F*D* told the RARE crew to pay up or …. “settle” the dispute “on the street outside” ! !